Note: This story was originally published on January 13, 2014. In September 1993, Connecticut State Attorney Frank Maco declared that he would not prosecute Woody Allen in court for the charges of sexual abuse of a child. He did, however, publicly declare that he had both probable cause and evidence that such abuse had taken place. According to The New York Times, the decision was made to protect the child in question from the publicity and trauma of a court appearance. After all, Dylan Farrow, who'd recently told her mother and pediatrician what had happened in the family's attic, was only 7 years old. That same year, I saw Annie Hall for the first time. I was lying on the floor of my grandfather's study in Gramercy Park, because it was dark and had the biggest TV screen in the house, and he wanted my first Woody Allen experience to be as close to the big-screen movie experience as possible. I got it. Well, I didn't exactly get it — all these grown-ups falling in and out of dizzy, messy, complicated love — but, I got why this was great. I'd never felt so instantly connected to a film. I wanted to run out of my grandparents' apartment and into that New York, all swingy with jazz music and magical thinking made manifest. I looked up at my grandfather and saw him laughing like I'd never heard the man laugh before. This was a formal, grandfather-clock of a grandfather, and to see him whack the arm of his chair with a fist in sheer delight as the onscreen couple whizzed across the city in a VW Beetle made me understand why people loved Woody with such reverence and passion. He made so many great things — New York, the film world, Diane Keaton — even greater under his gaze. A decade later, I read Mia Farrow's memoir, What Falls Away. For the first time, I learned about the allegations of abuse leveled at him by his youngest daughter. At the time, I was in film school, a path I chose in no small part, because of Woody Allen's influence on me. Not only was it his work that taught me to love cinema, his language was that of my own family. "I luff you," my mom would call up the stairs as I headed for bed. "Lurve you, too!" So, when I read Mia's book, I was incredulous — but I did my research. You can't have grown up in New York in the '90s (or maybe, anywhere, ever?) and not have known the wild tale of Allen marrying his college-aged step-daughter, Soon-Yi Previn. But somehow, that became a part of his oddball legend. The man made a great movie, but we all knew he was a wackadoo in real life. But what of this other daughter? What about Dylan in the attic, found terrified and naked from the waist down, claiming that her father put his fingers inside of her? Why isn't this part of the story? It is — we just don't like to tell it. Last night, when Allen was awarded a lifetime achievement award for what is undoubtably an outstanding, untouchable body of work, his biological son, Ronan, tweeted: "Missed the Woody Allen tribute - did they put the part where a woman publicly confirmed he molested her at age 7 before or after Annie Hall?" I hope we all heard him. Three months ago, Dylan Farrow (who now goes by a different name) was interviewed by Maureen Orth in a follow-up feature on Mia Farrow that Vanity Fair published after the scandal. It was this confirmation Ronan referred to, marking the first time Dylan has spoken publicly about her experiences with Allen and the lasting traumatic effect it had on her life. "I’ve had physical breakdowns because I opened a magazine to the wrong page...I’m scared of him, his image," Dylan said. "Nobody wants to think this legendary filmmaker is my worst nightmare. That’s what scares me, when I picture things chasing me or happening — I think it’s him after me. It’s hard to explain how terrifying that is." It was that same article that set the media into a tizzy with the suggestion that Ronan might be Frank Sinatra's son. But while the world examined Ronan's facial features, I read and reread Dylan's interview in the piece, feeling as if I deserved to do penance for every time I gushed about Manhattan; for the paper I wrote on Annie Hall; for cuddling up with my boyfriend to watch Love & Death on a cozy Sunday night. I felt like the dinner guest politely looking away while the husband slams his wife into a wall. How could I be so callous? I spent a week wondering if it was okay to still like (love, really) the work of this man who so clearly was a monster. I forgot about it. Then, Ronan tweeted and I finally made a decision. Am I weak for hanging on to my well-worn Annie Hall DVD? If Dylan was my sister or my friend, I know I'd throw it away in a heartbeat. Can you love a piece of art, knowing the artist who created it is an imperfect, perhaps even evil person? What about Roald Dahl, a public anti-semite? Or Walt Disney, whose own questionable past was called into question just last week? Are we going to deny our children Matilda or Mary Poppins? After all, what good could it possibly do at this point? So, can we still love the work of Woody Allen? For me, the answer is an uneasy yes. Because I do. To say I'll stop would just be another lie in a situation already mired in falsehoods and overlooked facts. I think we can still love the work of Woody Allen, but under one condition: This part of his story is told. No more burying the bad beneath the slightly less bad. And certainly no illusions that the whiny, hypochondriac charmer on-screen is anything more than a character he created. 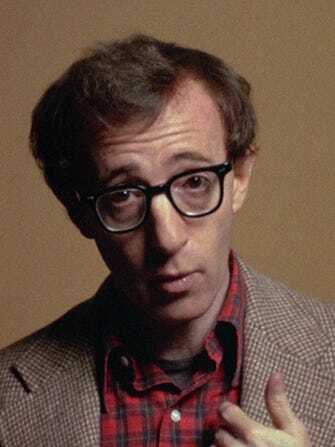 I believe Alvy Singer is an underdog. I believe Woody Allen is a child molester. Maybe one person writing one post on the internet isn't going to change the tide of cultural consciousness. Still, what is cultural consciousness but a number of individuals creating a story? If only a few hundred people make it to the end of this post, then it's a few hundred people who have their own decision to make. I'll take it.